In this video, I review the first half of a session from one of the PokerTrikz forum members. He plays his normal game at 10NL and I add my own narration to the video. At times, I will stop and go into specific details about interesting hands or situations that arise. This is a great video for any members that have watched my videos, but still find themselves struggling at the micro stakes. I focus on tightening preflop raising ranges and focusing more effort into value betting this tighter range. Thank you to Brizzle for the video submission and I hope everyone enjoys this 10NL review series. During the video, I saw a lot of preflop raising with sub-par hands such as K8o, 79o, and 35o. I think newer players see videos where someone is raising a super wide range of hands on the button and they think it’s cool and try to do it themselves. What they don’t realize is the money they lose due to post-flop mistakes with these hands is going to far outweigh the miniscule gains they earn from the preflop gains. Even if a player has enough knowledge and skills to consistently outplay their opponents post-flop; it is going to be a lot of work to overcome the natural -EV to playing something like 35 offsuit. 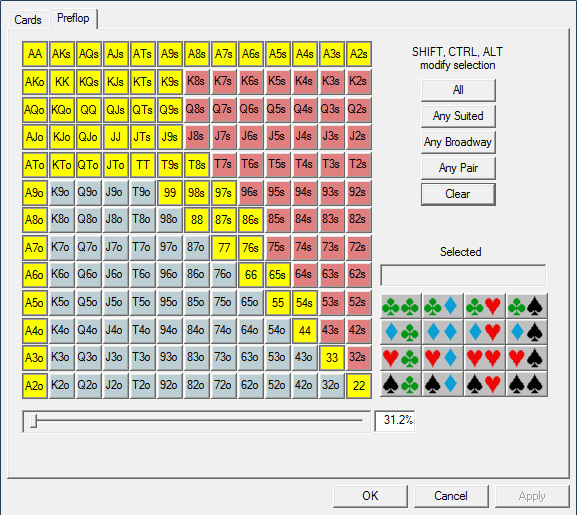 While no preflop range should be set in stone, I would much prefer you stick to something similar to the picture below. This is a good range of hands for a player that whats to play a loose game on the button, but doesn’t have much experience with value betting thin and running double and triple barrel bluffs (which I advise heavily against at these limits). Feel free to swap a few hands in or out as you please, but stay away from the offsuit gappers and broadway + trash. The software is called PokerStove. Getting the most value from every hand we play is a necessity because we are playing a smaller, but stronger range of hands than our opponents. We are trying to win a lot of medium to large sized pots because we forced our opponent to make tough call downs with hands like K9 that we have outkicked with a KQ. When you win an extra turn or river bet from an opponent, it is normally equal to 3-4 small pots that you gave up on the flop. Playing strong hands when larger bets are being made is going to be your #1 money maker at these games. There is a good example of a missed opportunity at time 3:30 of the video. A short stack player limps UTG+1 and we raise on the button, which is called. The flop comes , which is fantastic for us because we make top pair and there are some draws out there we can charge. I would make a 70-90% pot bet in this spot to charge my opponent with draws and small-medium pocket pairs he played this way. Our opponent check/calls a 60% pot from the hero. The turn comes a . This makes the board , which is fantastic for us. The improves almost nothing in the opponent’s range of hands and it makes it more likely he picked up a random flush draw. I would be betting 80-100% pot and hoping to commit my opponent’s short stack with bad pot odds. Hero bets too small for only 50% pot and the villain calls. The river comes a total blank and the board is . The villain checks and Hero quickly checks behind for a showdown. I 100% disagree with this play and can’t think of a hand besides that now beats us. Even if you can’t figure out why your opponent would call your river bet with a missed heart flush draw here, there isn’t much of a reason to not bet. Unfortunately the villain had Qh5h and we could of got him to call the river bet a percentage of the time with his rivered 2nd pair. This video was made on the PIV Game Network, which is a multiplatform poker site that offers 6 different poker rooms. This is very similar to my #1 recommendation - Muchos Poker. You create just one account at Muchos Poker to manage your bankroll and you will have access to TEN different poker sites with your money. This allows you to play at the most popular time of day at the different poker rooms and is ideal for tournament players that want to play at a different room every day. By signing up through this link on PokerTrikz, you will receive the highest rakeback and bonus payouts available at each individual poker site. This lets you take advantage of the great rakeback offers on the Cake and Revolution network and some nice sign up bonuses on the European sites, such as 888 and the iPoker rooms. PokerStars is my #1 choice for players. They are the largest and most secure poker room on the internet.